WOW! Can you believe it’s been one whole year since we published our first knitting pattern - Flower Power Elephant? Today is our 1st year shop anniversary! We want to thank everyone for visits on our site. Thanks for all your commitment and interest in our knitting toys patterns. Our doors are always open and we are more than happy to create new patterns for all of you. 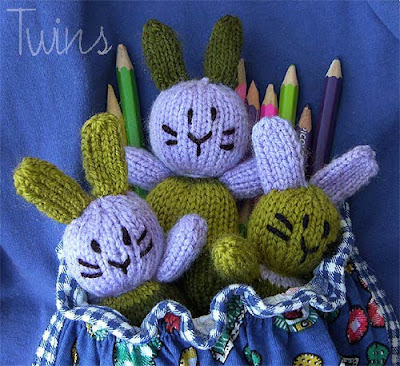 To celebrate our anniversary, we are offering next free pattern - Amigurumi Pocket Bunny. 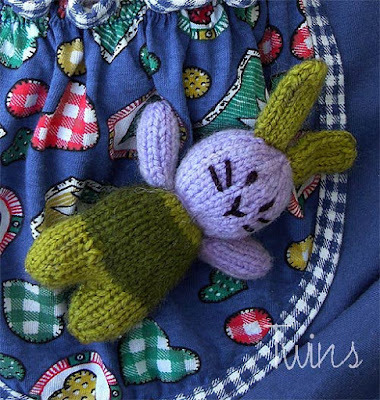 The Amigurumi Pocket Bunnies are made from very small amounts of yarn. They measure about 12 cm (4,7 inch). The pattern is written in two versions: on DPNs and on stright needles. Leftovers from different projects of a similar gauge in DK or worsted in dark green, light green, lavender and black yarn. The body is worked in the round. No ugly seams and you have only to make few other things to finish your knitting. Body, head and legs (in one piece ) Knit round starting from a top of head. Cast on 9 stitches using lavender yarn. Distribute among 3 needles and join. Place marker. Change yarn into light green. Change yarn into dark green. Now work on 12 sts only. Knit round. Distribute the 12 sts among 3 needles and join. Cut yarn. Thread it through sts left on knitting needles, pull to gather tightly, then fasten off. Now stuff the body and first leg. Second leg – Now knit left 12 sts. Knit round. Cut yarn. Stuff the leg. Thread it through sts left on knitting needles, pull to gather tightly, then fasten off. Ears (make2 pieces) Knit round. Cast on 9 stitches using light green.. Distribute the sts among 3 needles and join. Cut yarn. Thread it through sts left on knitting needles, pull to gather tightly, then fasten off. Arms ( make 2 pieces) – knit round. Cast on 9 sts using lavender yarn. Tail ( make 1 piece) – knit round. Cast on 9 sts using light green yarn. Distribute the sts among 3 needles and join. Neck and head: Sew the hole on top of head. To shape neck use light green yarn and gather around first knitted row of light green round. Pull up tightly and secure. Sew yarn ends into neck. Stuff arms with fiberfill lightly, sew arms onto body on the light green stripe. Sew the tail on opposite side of bunny’s body. Ears: Don’t stuff ears. Join cast on row and than saw ears to the top of head. Distance between bunny’s ears is 1 stitch. Nose, eyes and whiskers: Using black thread make a nose and whiskers. Embroider eyes. Distance between eyes is 2 stitches. All pieces of toy are worked on straight needles. Body, head and legs (in one piece ) Knit flat starting from a head. Cast on 11 stitches using lavender yarn. Now work on 13 sts only. Break yarn. Thread it through sts left on knitting needles, pull to gather tightly, then fasten off. Second leg – Now knit left 13 sts. Cast on 11 stitches using light green.. Rows 1 - 10: st st (10 rows). Cast on 11 sts using lavender yarn. Cast on 11 sts using light green yarn. Cut yarn. Thread it through sts left on knitting needles, pull to gather tightly, then fasten off. Join row ends of the tail. Neck and head: Join row ends of the head and body. To shape neck use light green yarn and gather around first knitted row of light green round. Pull up tightly and secure. Sew yarn ends into neck. Ears: Join row ends of the ears. Don’t stuff them. Saw ears to the top of head. Distance between bunny’s ears is 1 stitch. 1. You are granted permission by us to use the knitting instructions for your personal use, charity and knitting pleasure. 2. You agree to use the file and any print-outs of its contents for personal use only. 3. 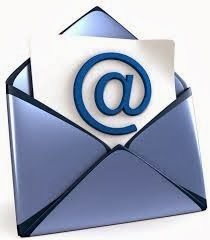 Re-selling or sharing of the file or its contents, either in whole or part, is not permitted. 4. You may not sell the finished toys made from the pattern.